It's gift central around here, and my list of to-dos just keeps getting longer. You know, a table runner here, a set of coasters there...! I have to admit, though, holiday sewing can be so worthwhile. It's so much more fun to gift something I've made to people who really appreciate it (my family and friends!). My only qualm: I remember how totally drained I felt last January after making until the very last second of December (plus we went away for Christmas, so that increased my speed...). I worry that I'll end up feeling like that again. As a result, I'm trying to get as much done as possible in the early days of December. After I nearly finished the top of my Utopia girl quilt for one of my little nieces, I moved on to plotting a star quilt. I've never made an all-solids quilt, and it's going to a special person. I'm using one of the American Made Brand solids as the blue (I'm pretty sure it's Dark Indigo) with Kona White. Basically, I'm combining a bunch of different stars from blogland. 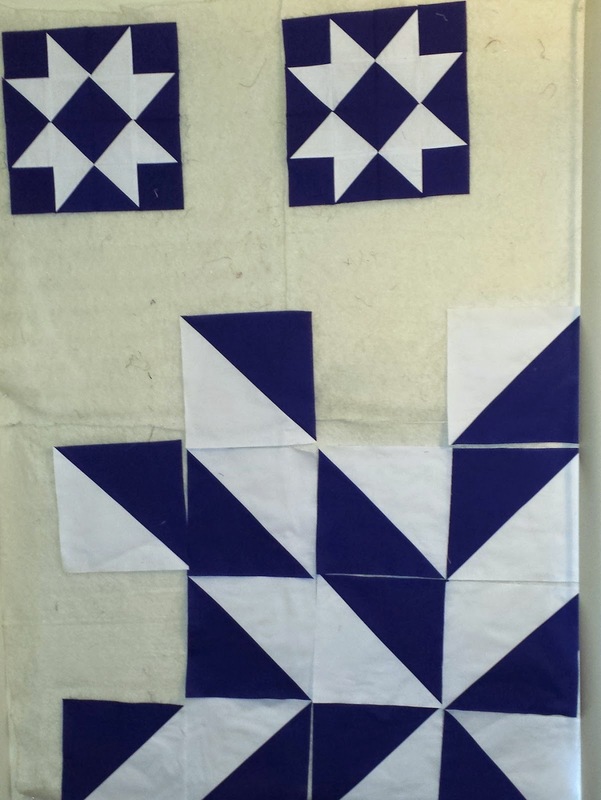 The top two are Ribbon Stars from Fresh Lemons Quilts, and the bottom star is a fragmented star featured at Night Owl Quilting. I made a Pinterest board of other star possibilities. There will be plenty of negative space, too. Hopefully this obsession with traditional-ish piecing continues... at least, until I piece them all together in a non-traditional format. :) This quilt is my December goal for ALYoF! Then, on Sunday, I spent almost 6 hours straight putting together this t-shirt quilt top (about queen size) for my brother for Christmas. He insisted on coming over to our apartment on Saturday night to lay out the already-cut shirts (eventually, he admitted that I knew was I was doing! :) ). I decided to log all the time (and $) I spend on this laborious t-shirt quilt, so I'm keeping track on Instagram (I'm @quiltyhabit) with the hashtag #tshirtquilttimelog. I'll write a big blog post at the end of the process. So far, I'm up to 7.5 hours of labor, which comes out to $112.50 if I'm paying myself an hourly fee of $15! I'm hoping this experiment will force me to really consider all the costs of making a t-shirt quilt and to consider commissions more carefully in the future. The best part is that none of these projects feels like a chore so far (not even the t-shirt quilt). So far, so good for my quilty well-being. I think logging time on quilts every once in a while is so worth it! I just downloaded a stopwatch app for my phone, it helps me keep track of my actual time spent working on the quilt between tending the kids. The museum medallion quilt is already up to 17 hours of work--not including the time it took to plan fabrics, layout, research the pattern, look at other people's version to see how they did something, etc etc. I'm only keep track for my own records and so I can better price this type of quilt should anyone else ask me to make one for them (though I will never again use that pattern!). I can't believe you're planning to finish two quilts and a bunch of other stuff for xmas! No wait, yes I can, you are super productive. Good luck Jess! I'm making some decorations but not presents. No pressure if I don't finish on time. I would like to make teacher gifts but the trouble is my daughter has had the same teachers three years in a row and i keepp having to come up with new ideas. Ugh! 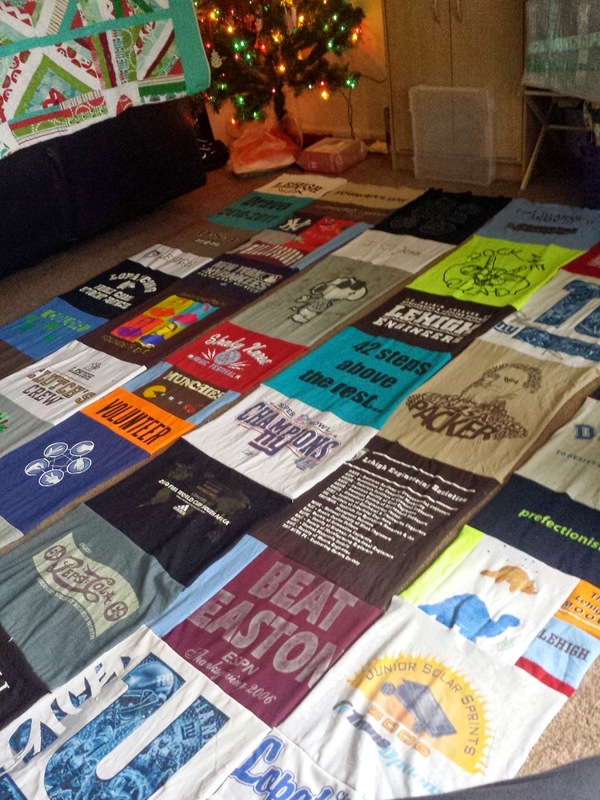 T-shirt quilts! I am glad you are enjoying making it. Doesn't it seem that everyone wants you to make a t-shirt quilt? $15/hr is little enough! I was intending to sew gifts for my class mates at LQS but we've decided to give money to OxFam for a water well instead -- that's me off the hook this year! Since I have only eleven more days till I go north to fetch dd and the Grandboys here for an early Christmas celebration and only a few of those will be spent in my sewing room, I'm glad I'm not under pressure to make gifts. Good luck with your goals; both projects are looking good. Looking great, Jess! I love the idea of logging your time to find out what the *actual* cost/value is. . . I'm curious to see just how expensive a t-shirt quilt really should be! Good luck getting things done on the early side of December! Good luck with all the Christmas sewing and good luck on getting it done sometime ahead. Hoping you can avoid feeling stressed or drained. Happy holiday making! I hope you get done early so as not to drain yourself out for January! you're a present making machine! I'm sure you can get it all done given your recent bout of productivity. Hopefully you get to do some selfish sewing after all the gifts are made :) The star quilt is going to be amazing... you know me, I love solids, and traditional piecing, hehe. You're definitely not going to be hurting for Friday Finishes blog posts for the next month or so!